History of Geology: It Came From the Ice! One of the most classic monster of movies is without doubt the "mummy", mostly of Egyptian origin and with human shape (despite the fact that thousands of Egyptian mummies of various animals are known). Still today we are fascinated by the effort put into the preservation of a body, the ultimate victory above decay, corruption and finally death himself. But there are not only artificial mummies, nature offers various methods to create "natural mummies". Corpses can be preserved in bog deposits - to acid for decomposing organism - or tar pits - to poorly oxygenated - or permafrost - to cold for an effective decomposition of organic matter. Natural mummies discovered in permafrost of ice age mammals offers a broad spectrum for research: taxonomic relations and dispersal history can be studied trough the ancient DNA, the structure of soft tissue can be observed in detail, paleo diet can be inferred by the gut contents and faeces, on some carcasses the circumstances of death can be observed - some animals show injuries, pathological deformations or tissue changes and parasites. In the Siberian permafrost the best preserved specimens are those of mammoths, especially young and small individuals like the 40.000 years old mammoth calfs "Dima" (discovered in 1977) and "Lyuba" (2007); one of the oldest specimens is the 50.000 years old male "Khroma" (2009). The carcass of Khroma, partially eaten by modern scavengers, was discovered in July 2009 by a local hunter on the banks of the river Khroma. A preliminary study showed that in the carcass fossil germs were preserved, most probably anthracis, which can cause anthrax and black lung disease. To prevent any possible contamination of involved researchers it was decided to sterilize the specimen. The still frozen carcass was therefore bombarded with a massive dose of Gamma-rays in a laboratory in Grenoble. Bacteria can theoretically survive long periods when frozen. In 2007 an international research team announced the discovery of 500.000 years old bacteria with intact and active DNA-sequence in samples of permafrost. 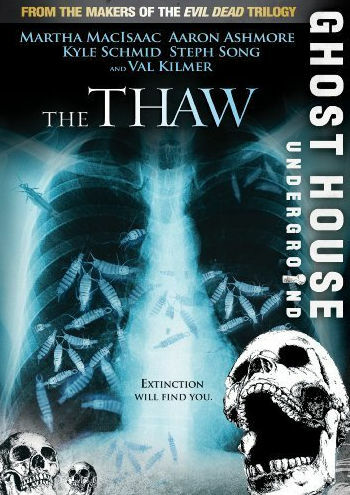 The scenario of a still living pathogen or parasite inside a frozen and preserved body of an ice age mammal is also the main storyline of a TV-horror-production of 2009, named appropriately "The Thaw" (strangely the title for the German release is the exact opposite - "Frozen"). In a remote region of the Canadian tundra a carcass of mammoth (Mammuthus primigenius?) is discovered in a melting glacier. This is a common misconception, the natural mummies discovered until now were preserved all in permafrost soil, which contains local ice lenses of secondary genesis. This ice maybe plays an important role in the desiccation and preservation of the carcass, as moisture migrates from the body to the ice. Anyway - the warming of the Canadian Arctic due anthropogenic climate change not only releases dead mammoths from the melting underground, but also a deadly and living pathogen - a parasite in from of an arthropod (a - bug - as noobs call it) that needs body heat. To survive inside its host the parasite weakens the immune system (as some real parasites do) - this behaviour would finally cause the death of the host, if the flesh-eating bugs (arthropods) didn't also multiply so fast that they eat their victim from inside. The movie uses a environmental cause (the disease is released due the warming of the planet caused by our actions) as premise, most of it is however clearly inspired (or copied) from the movie "The Thing" (1982), even if there the parasite - first hiding and then exactly copying its host- is an alien lifeform. The Thaw doesn't really explain the origin of the parasite, but it seems almost certain that it is of terrestrial origin and also so deadly that it caused the extinction of the entire Pleistocene megafauna. The idea of an unidentified hyperdisease killing animals was proposed in 1997 after the first epidemics of Ebola in 1976-1979 and 1994-1996. Main vector of the presumed pathogen was Homo sapiens, infecting mammoths and other large mammals during his travels around Siberia and North America. 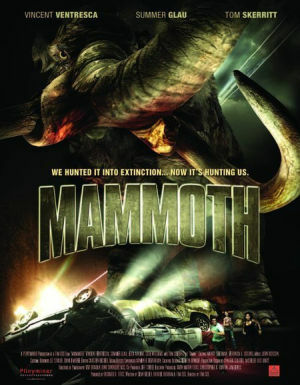 In 2006 a research on the pathological malformations of bones from American Mastodon (Mammut americanum) and bison bones suggested that the animals suffered from an infection of tuberculosis. A relatively large number of geographically and temporal separated individuals showed those malformations. A recent example how dangerous pathogens can be for an isolated population was observed on the Christmas Islands in the Indian Ocean. In 1899 human colonization and introduced black rats (Rattus rattus) brought a unicellular parasitic protist (Trypanosoma) onto the islands. The endemic rat species (Rattus macleari) was not immune against the introduced parasite and the population suffered a rapid decline - in 1904 the species was considered extinct. However this is an example on a very confined space, involving a single species - it remains unclear how a single pathogen could wipe out so many species in such a short time on almost the entire planet.